Scroll down to the bottom of th page and click on the New Subgroup button. 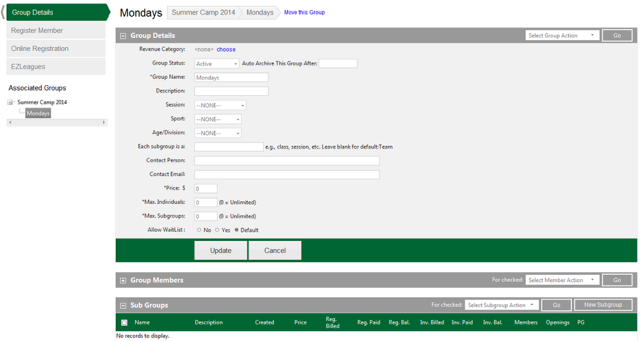 Populate below fields using the Parent Group: Check the box to populate fields below with the parent group details. If you would like your clients to see the description on their invoices see How to Include Group/Subgroup descriptions on Invoices. Each subgroup is a: is a text-box, enter what each subgroup is (session, class, camp, clinic, etc). The default will be team if this box is left blank. This is important for when setting up online registration. When setting up online registration you will need to setup registration fees with a registration type. When choosing With a “Subgroup” or New “Subgroup” the “Subgroup” will be replaced with whatever you put in the Each subgroup is a text-box. Save & Return: Saves the subgroup and takes you back to it's parent group to add more sub-groups to the parent group or register members. Your sub group now appears listed at the bottom of the parent group details page, you can create as many sub groups as needed. The subgroup can be accessed by clicking on the subgroup name itself or the edit (pencil icon) on the far right. The red X can be used to delete the entire subgroup. ** Warning: deleting the subgroup does not void any billing for those registrants within the group. Save & Continue: Saves the new subgroup and keeps you in the new subgroup to continue adding subgroups or register members. Once you have filled in the necessary or desired fields and you want to continue adding subgroups click Save & Continue. Save & Continue: Allows you to continue adding sub-groups to the previous sub-group you created. You can create as many subgroups as needed. Note: You can continue adding sub-groups by clicking on the New Subgroup button at the bottom right hand corner of the page or Register clients into this subgroup by clicking on the Register Member tab located in the upper left hand corner of the page.